The Thai team is led by Rachan Trairat (in charge of Thailand Tata Motors sports) along with businessmen from different sectors. Myanmar team will be led by Hla Maung, President of Border Trade Chambers of Commerce- Tamu & Kalay also an Executive Member of Union of Myanmar Chambers of Commerce and Industries, Yangon along with other businessmen, Sonam informed. He said that a meeting with Secretary of Youth Affairs and Sports, Government of Indi Rahul Bhatnagar have consent to make himself present for Flag Off ceremony of the India Asean friendship car rally at Tawang. Doordarshan Sports Channel ADG Satyajit Mishra and Additional Manager Abhisek Dubey has also given us their consent to present for the Flag Off ceremony on 12th of September 2018. DD Sports Channel being the media partner of this international event, will promote and publicise the Flag Off ceremony with live broadcast. He informed that the Tourism Authority of Thailand (TAT) in India is also willing to promote tourism between India and Thailand. 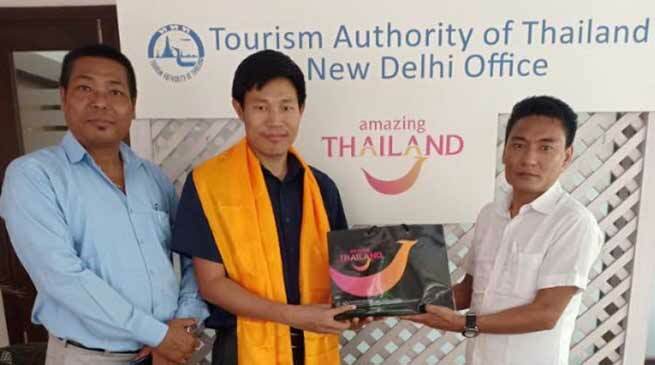 A meeting was held with Marketing Officer of Tourism Authority of Thailand, New Delhi Shingreiso Shimrey the today about the activities during the car rally and the theme of the event in details. Where as TAT’s officials expressed their willingness to associate with the upcoming international event of India Asean friendship car rally 2018. Sonam added.